On Oct 11, we issued an updated research report on Kennametal Inc. KMT. This Zacks Rank #3 (Hold) company is poised to grow on the back of solid end-market sales and strategic restructuring moves. However, escalating cost and rising debt burden remain two major causes of concern. Indicating neutral analysts’ sentiments, the Zacks Consensus Estimate for the company’s earnings remained unchanged for fiscals 2019 (ending June 2019) and 2020 (ending June 2020) in the past 60 days. Lets dig deeper into the fundamental factors influencing the stock. Kennametal’s year-over-year revenue growth was 15% in fiscal 2018 (ended June 2018). Notably, the company’s top-line numbers grew 12% organically in the last fiscal. The company believes sturdier demand from prime end-markets (such as aerospace, automotive, machine tool, farm machinery, highway construction, coal mining, and oil and gas exploration) will continue to bolster its revenues in the upcoming quarters. For fiscal 2019, Kennametal anticipates to secure organic revenue growth of 5-8%. By fiscal 2021, the company projects adjusted sales to be nearly $2,500-$2,600 million. Per our estimates, Kennametal’s year-over-year revenue growth will be 6.7% and 4.6% for fiscal 2019 and fiscal 2020, respectively. 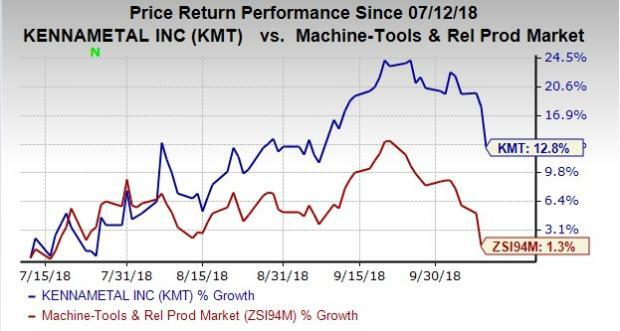 Over the past three months, Kennametal’s shares have rallied 12.8%, outperforming 1.3% growth recorded by the industry it belongs to. Kennametal pulled off an average positive earnings surprise of 11.21% in the past four quarters. The company believes stellar sales, price-realization efforts, diligent cost-cutting initiatives and restructuring moves (such as head-count reduction) will continue to drive its bottom-line growth in the quarters ahead. Notably, the company expects that its restructuring moves will bring in annualized pre-tax savings of roughly $10 million in fiscal 2019. Kennametal currently projects to report earnings of $2.90-$3.20 in fiscal 2019, higher than $2.65 per share recorded in fiscal 2018. Per our estimates, the company’s year-over-year earnings growth will be 18.5% and 12.7% for fiscal 2019 and fiscal 2020, respectively. Kennametal’s cost of sales escalated 9.6% year over year in fiscal 2018. The company’s costs of revenues have been rising primarily on account of material price inflation. Kennametal expects the issue to persist in fiscal 2019 as well. In addition to this, escalating operating expenses are adding on to the company’s aggregate costs. Upbeat wage rates, higher sales incentives and management expenses, as well as increased overtime and temporary help costs might continue to increase operating expenses, in turn dent Kennametal’s profitability in the quarters ahead. Kennametal's long-term debt balance at the end of fourth-quarter fiscal 2018 was approximately $592 million. Though this balance represents 15% decline from the previous quarter, fresh issuance in the quarters ahead will likely increase this balance. It is worth noting here that the company issued $300 million of senior unsecured notes in the fourth quarter of fiscal 2018, as well as an amendment to a revolving currency facility in the quarter increased its borrowing capacity by $100 million to $700 million. Total debt (long-term debt plus current portion of long-term debt) at the end of the fiscal fourth quarter was $992 million, versus compared with $697 million reported at the end of third-quarter fiscal 2018. Interest expense, in fiscal 2018, flared up 4.3% year over year. We believe, if unchecked, high-debt levels can increase the company's financial obligations and prove detrimental to its profitability in the quarters ahead. Moreover, we notice that Kennametal derives more than 50% of its revenues from the company’s overseas operations. Though international diversity increases business scope, it also exposes the company to risks arising from unfavorable movement in foreign currencies and geopolitical issues. While foreign currency translation had a positive 4% impact on revenues in fiscal 2018, it is predicted to adversely impact the top line in fiscal 2019. Altra Industrial Motion Corp. AIMC sports a Zacks Rank #1 (Strong Buy). The company pulled off an average positive earnings surprise of 4.01% in the past four quarters. You can see the complete list of today’s Zacks #1 Rank stocks here. Donaldson Company, Inc. DCI flaunts a Zacks Rank of 1. The company delivered an average positive earnings surprise of 2.29% in the trailing four quarters. Enersys ENS also holds a Zacks Rank #1. The company generated an average positive earnings surprise of 2.86% in the last four quarters.